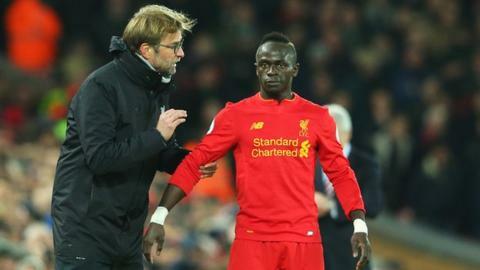 Liverpool manager Jurgen Klopp has played down claims that Sadio Mane will be fit for next month's World Cup qualifiers against South Africa. Mane was ruled out for six weeks with a hamstring strain on 10 October but Senegal coach Aliou Cisse said this week he will be "100% fit" for the matches on 10 and 14 November. "I don't know how he can know. I don't know - that's how it is," said Klopp. "If he is fit earlier, I'd be really happy but nobody knows at this moment." Livewire Mane suffered the hamstring injury as Senegal beat Cape Verde 2-0 in a World Cup qualifier on 7 October. Former Birmingham City midfielder Cisse told reporters in the Senegalese capital on Wednesday there was "no doubt" in his mind that Mane would be fit for the crunch ties. "Sadio is still in rehab, still (training) indoors. He is not even doing any exercises outside so that is the situation at the moment," said Klopp. The Senegalese need two points from their remaining two qualifiers, both against Bafana Bafana, to qualify for their first World Cup since reaching the quarter-finals in 2002. They originally lost 2-1 to South Africa in Polokwane last year but Fifa ordered the match to be replayed after finding Ghanaian referee Joseph Lamptey guilty of match manipulation. The replayed game will take place in South Africa on 10 November, with the Senegalese capital Dakar hosting the final qualifier four days later. The Teranga Lions currently lead Group D of African World Cup qualifying with eight points, two more than both Burkina Faso and Cape Verde, while South Africa lie bottom with four points. Both Senegal and South Africa have a game in hand on their group rivals because of the enforced replay.